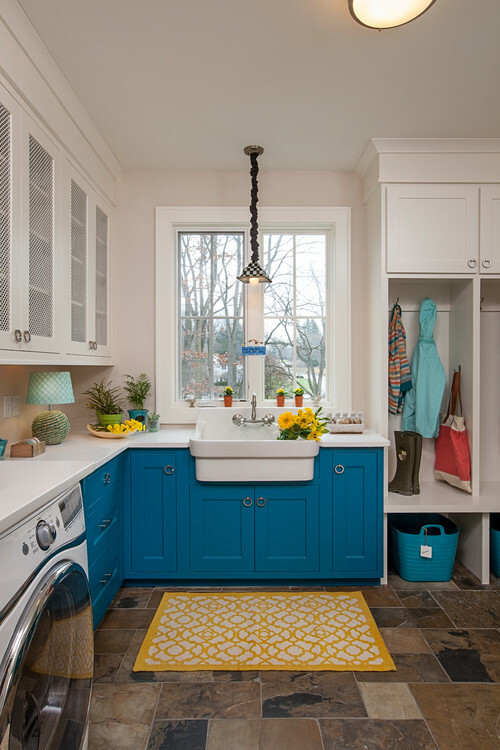 Apart from the kitchen, the laundry room is one of the most used rooms in a home. We spend countless hours in this room and so homeowners are making this space more stylish yet multi-functional. 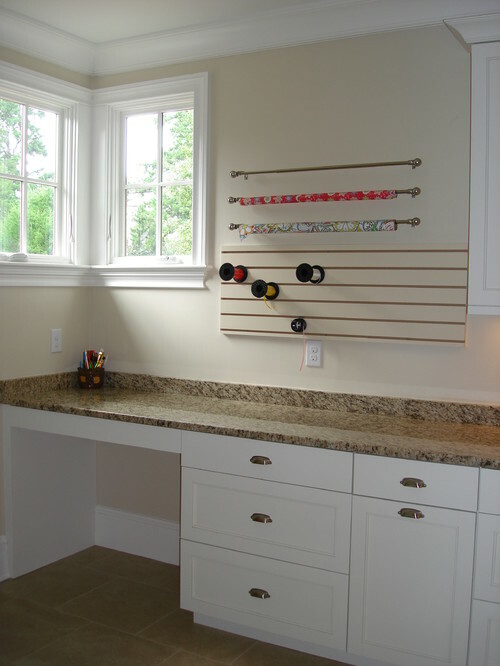 The laundry room can be a great place to add some needed extra storage. If you have enough space, why not make the most of it by maximizing the number of cabinets in this room. If you have a front-loading washer and dryer, it allows you to add upper cabinets above them as well as counter space. Pantry style cabinets would be able to hide your cleaning supplies and smaller appliances such as vacuums, brooms, mops, while smaller base cabinets could store shoes and other smaller items. Homeowners are often requesting for laundry rooms to serve more than one function apart from being an area for the kids to dump their dirty clothes. This room can also serve as a craft room by adding a small desk unit and cabinets to hold all your crafting supplies. In the photo below we have added a board and some rods to house ribbons and wrapping paper. The laundry room can also serve as a small office. The point is that we want to design this room to be multi-use, so it can serve as the family’s command center; by allowing more opportunities for storage of backpacks, shoes, and other items that the family needs on a daily basis. Just because the laundry room is a space that is more useful than other rooms in the home it doesn’t mean that it can’t be beautiful. Choose fun colours for your cabinets and funky finishes. Adding a crown molding to the cabinets will elevate the style and appearance of the space. Adding a nice and fun back splash can help jazz up the room. Whether you’re remodeling your existing laundry room or creating a new one come and see us at Hardwood Creations where our expert designers will guide you through the process and help you create a beautiful yet useful space.